Pier & Waterfront Solutions (PWS) & ShoreMaster offer you eight dock frame constructions – PLUS – nine decking options. That’s more choices than anyone. Your Design is Our Commitment. Create your perfect waterfront experience with the most user-friendly dock systems on the market. ShoreMaster provides exceptional stability and versatile configuration options. 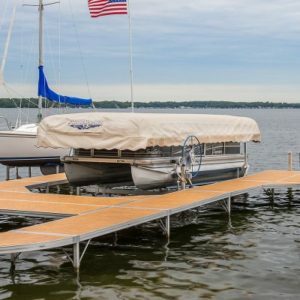 Only ShoreMaster docks have features like 5-sided dock legs and the Infinity Track System. 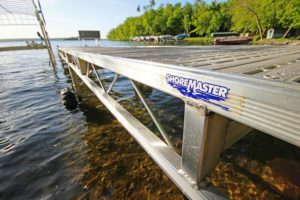 ShoreMaster dock systems use the exclusive Infinity Track accessory bracket and Infinity dock frame channel. With this combination, you have no unsightly holes to drill. There are no tools required for installation or removal of any accessory or dock section. It could not be easier to do! All accessories and dock frames can mount anywhere along the dock. Move them on a moment’s notice. Create endless configurations and customization. Best of all, there are NO TOOLS required. 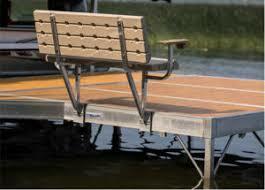 ShoreMaster uses extended leg pockets and braces on all standing & wheel-in dock frames. These features give you extra stability and strength. 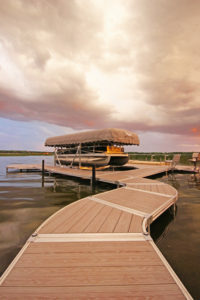 All ShoreMaster docks have recessed decking, so there are never any splinters or sharp edges to cause injuries. Standing or Wheel-in Configurations available. The ShoreMaster Infinity TS9 is aluminum framed durable, classic truss dock. The frame style is an excellent solution for owners looking for low maintenance and an easy-to-own dock. Perfect for rocky to soft lake bottoms with shallow to deep water depths and rough waters. The 9” frame is incredibly sturdy for its weight. It’s great for the rough waters of Green Bay. 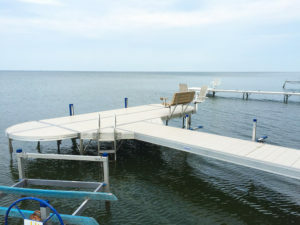 The TS9 truss frame is the most popular dock construction on the bay of Green Bay. Two unique leg mounting styles use a heavy-duty aluminum leg for more stability. 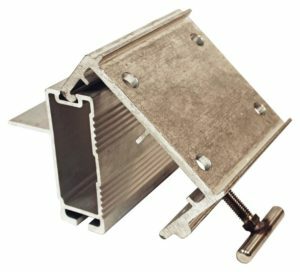 Optional 2”, schedule 40, galvanized steel legs are also available. With the Infinity Track system, accessories mount anywhere along its perimeter. Best of all – NO TOOLS REQUIRED. Combine the TS9 frame with RS4 curved corners for even more unique configurations. 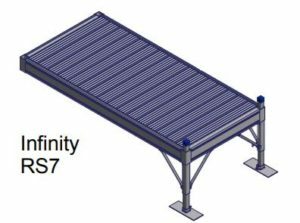 The ShoreMaster Infinity RS7 frame is one of the most stable and attractive dock systems available. The 7” frame can be configured to fit nearly any layout you desire. It is perfect for a rocky to soft lake bottom with shallow to moderate water depths. Galvanized steel legs are available to provide even more strength and stability. The RS7 frame is remarkably strong. Use the RS7 dock frame with the RS4 curved corners for even more unique configurations. The ShoreMaster Infinity RS4 is highly configurable and durable. 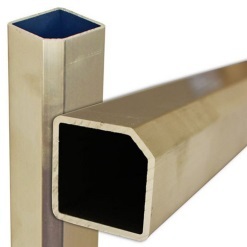 The Rail system frame is ideally suited for a firm or soft lake bottom. The 4” frame easily handles shallow to moderate water depths and waves. The Infinity Track System allows accessories to be moved ANYWHERE along its perimeter. NO TOOLS REQUIRED. Don’t forget – these frames are also combinable with the RS4 Curved sections for more configurations. ShoreMaster Floating FTS9 is the perfect choice for muddy, fluctuating, or deep water conditions. 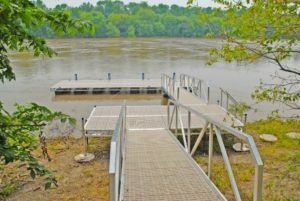 No more having to adjust the dock height during low or high water situations. 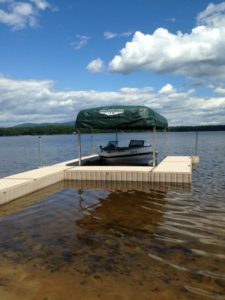 Using a premium dock flotation and a sturdy truss frame, we create an incredibly stable floating dock system. It looks great and requires minimal maintenance. PolyDock modular floating dock systems are perfect for a wide range of applications from residential to marinas. 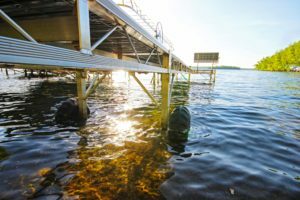 PolyDock is the ideal choice for shallow, muddy, deep, or fluctuating water conditions. Enjoy your dock and your waterfront without additional maintenance. Accessories designed to add value to your lake home, cabin, or cottage. 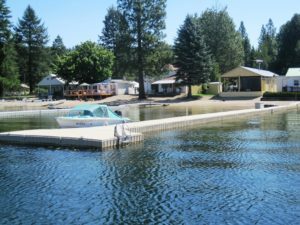 PolyDock is an excellent choice for nearly any residential dock application on a lake or river. Its modular design is made to last. Plus, it’s easy to add on as your needs change. PolyDock is simple to install and includes easy to follow, intuitive instructions. Whether you install PolyDock yourself or have PWS do it for you, you’ll be enjoying your new PolyDock system in no time. To sum it up – PWS is the place to find all your dock needs. 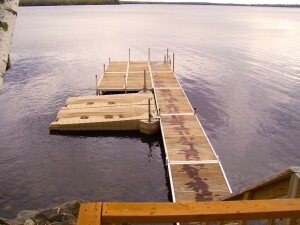 Need Help Planning a Dock System For Your Home or Cottage?